The bathroom is one of the most commonly renovated rooms in the house. Redoing the bathroom, or simply fixing it up, is a great way to increase the resale value of your home. In fact, many pros recommend tackling the bathroom as the most efficient way to increase market value. There are certain things that expert renovators will always to do a bathroom, and certain ways they have of doing them. 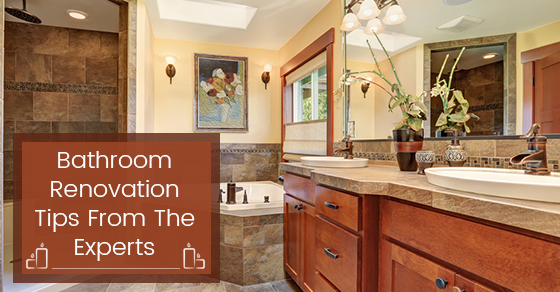 Below are six bathroom renovation tips that experts abide by. One of the biggest ways to add value to the bathroom is to invest in expensive finishings. Even if the fixtures themselves are not overly expensive, putting in some granite, marble or other natural stone is a great way to add a big dose of class in a cost effective manner. Having flattering lighting in your bathroom is something that you can’t compromise on. Many interior designers suggest dimmable pot lights in the ceiling, accent lights on the mirror and a waterproof fixture in the shower. Don’t go with lights that make you feel like you are in a doctor’s office. You should install at least one luxury fixture in your bathroom if you are renovating it. This could be a free-standing claw bathtub, or sinuous high-end faucets. You can even go for a sauna or steam room (both highly trendy items right now). Cluttered bathrooms, even if they aren’t technically dirty, are certainly not eye pleasing. This is why you want to make sure that you have plenty of space in your new bathroom for toiletries, cleaning supplies and anything that you would like to keep out of sight and out of mind. Many modern bathrooms are making use of typically bedroom-style furniture, such as armoires, to keep things stowed away. Having plants around your house is always a good idea. They add life, improve air quality and generally add an air of tranquility wherever they are. Your bathroom should be a relaxing, stress free zone and plants are the perfect way to add that feeling. Renovating your bathroom takes careful planning and execution, and the job itself is not something you are going to complete overnight. If you have never renovated a bathroom before and you are at a loss as to where to start, keep the above expert tips in mind and come away with the perfect bathroom that looks great and adds value to your home.